So a little bit of flour, some eggs and sugar and lots and lots of LOVE! 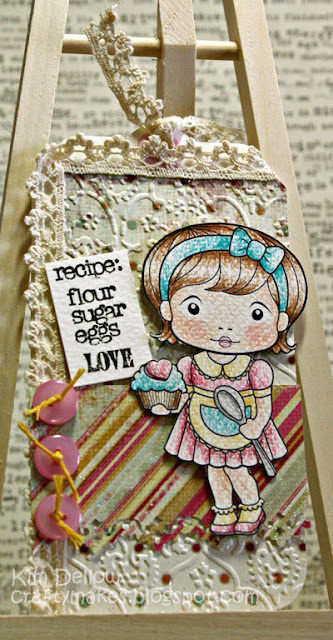 Yep it is the recipe for LOVE Cupcakes to send February out with a big smile on our faces! 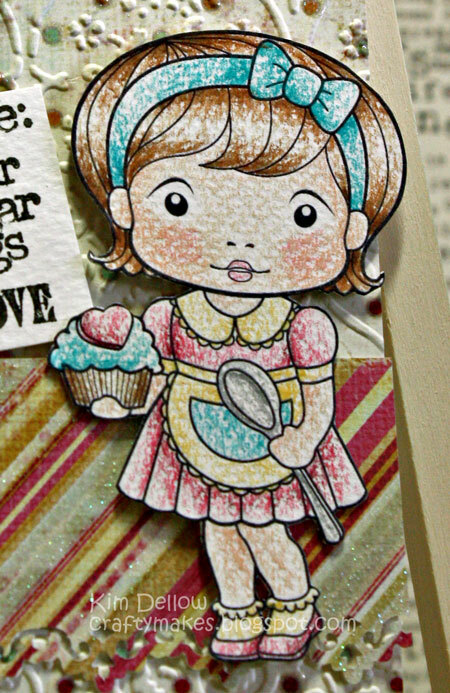 I've of course used the yummy Sugar n' Spice Marci for my tag and you can either get her as a digi-stamp or as a rubber stamp. 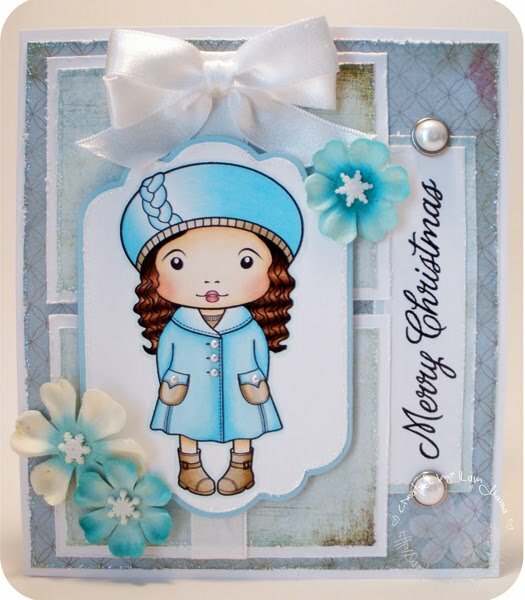 I thought I would add lots of texture so I've embossed the designer paper, added lace and buttons, used glitter papers and then used my pencils and some textured paper for the image. Hi everyone - GDT Debbie here to let you know that I've had some good times with La-La Land Crafts but now it's time to say goodbye! I've finished my 4 months as a GDT member and this is my last post as part of the team - but it doesn't mean I'm done with playing with LLLC images - I just adore Marci and Luka and can't wait to see what else they get up too - watch out for me in the Customer Gallery - LOL!! 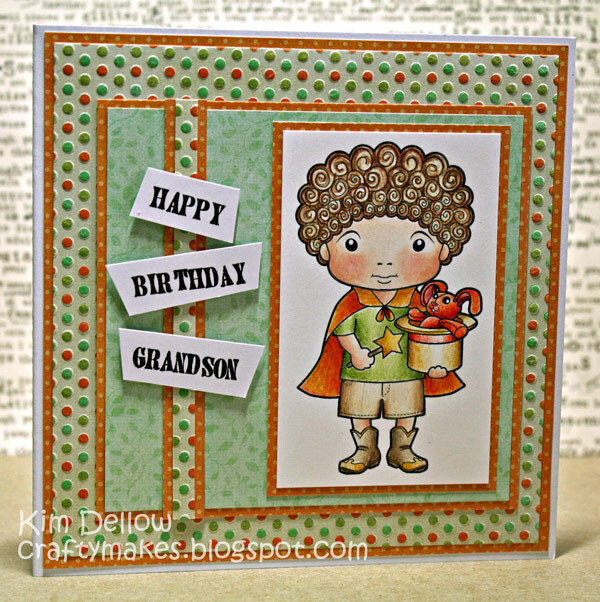 I want to thank Irina and the DT for having me on board - it was a BLAST - especially when I saw some of the CHA pictures and I could see MY CARDS sitting there - LOL. Maybe next year it will be ME and not just my cards playing at CHA, it's not toooo far from Australia is it?!?!?!? 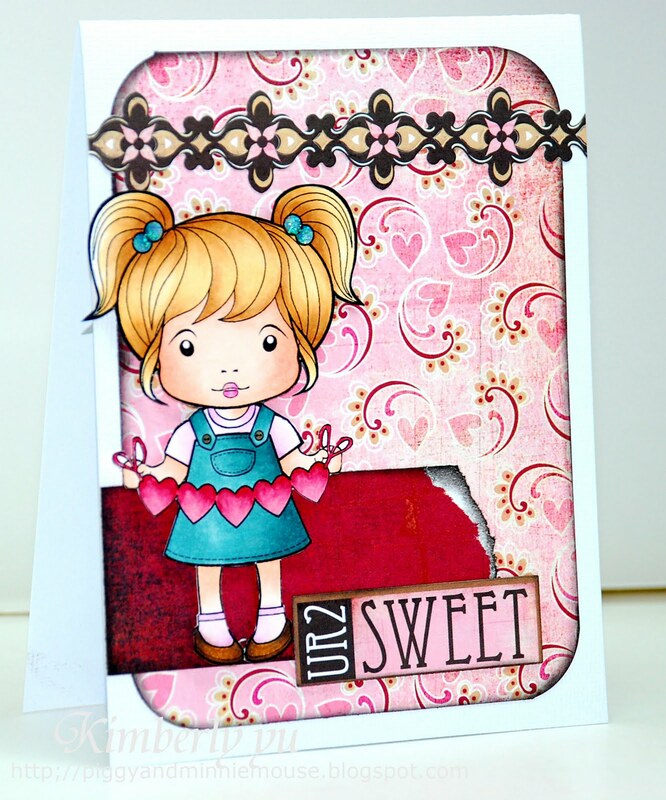 This cutie is Darling Marci and you can find here instore HERE. 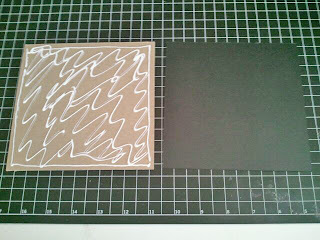 My DP is from my Basic Grey Curio paper pad and the border was punched using MS punches. Thanx again La-La Land for having me along and all the very best to the new gals coming in to play. Hi everyone Cindy here, welcome to my La-la Land post!!! I have Ballerina Marci to show you. 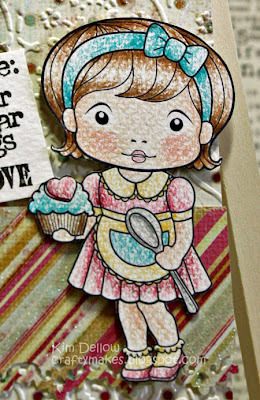 This is the first Marci that caught my eye in blog land, I just fell in LOVE with her. She is just so PRETTY!! 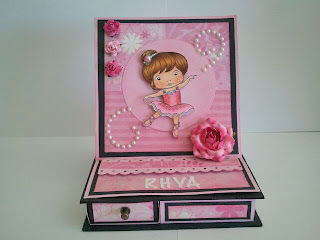 Remember if you create something with any La-La Land Crafts stamps or digis, please share with us in thecustomer gallery! Once a month we have a Customer Appreciation Day and one of you will win a prize! Wishing you lots of warm fuzzies today, as you've given all of us with your fabulous LaLa creations!! And there's much much more on her blog, Luvn the Journey! Kim here today. 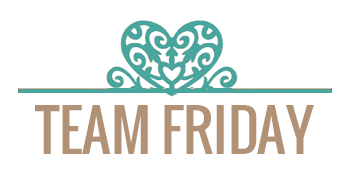 I guess by now you guys know that Friday is my day to post at La La Land Crafts. 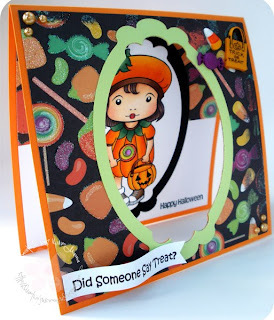 LOL Today I have this lovely Sweetheart Marci card to share! Sweetheart Marci is currently available as a digi so if you would like to play with her, you can grab her HERE. I colored Marci with Copic. 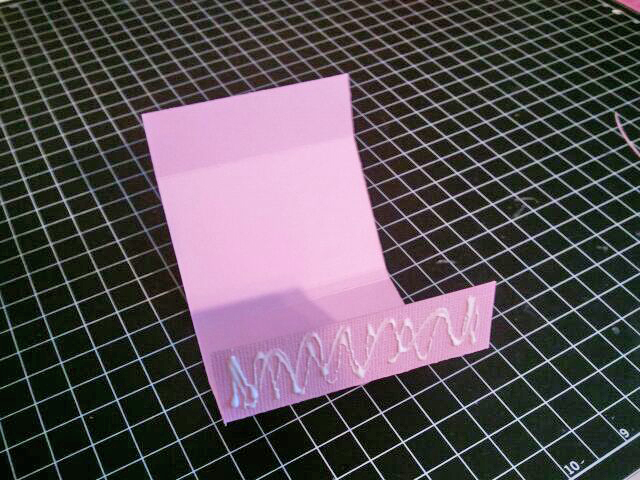 Sorry since I made this card a while back, I don't remember what colors I used already. 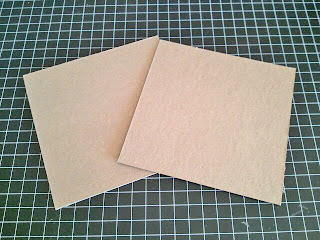 Papers are by Basic Gret, Bittersweet collection. I love this collection! It's not only great for Valentine's Day it is also great for any occasion! Love it! Have a great one everyone! Thanks so much for stopping by! Sitting here, thinking of you! Hi everyone, Jana here! I'm back with another Marci card today, this time featuring the adorable Capri Marci! She's just so sweet sitting there...and I love coloring her hair red! She pairs so well with this gorgeous bright and cheery DeLovely papers from Cosmo Cricket. And...aren't her little earrings adorable??? Love the mini pearls from SU! 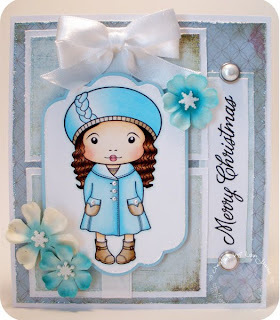 It's a quick and simple card today as I'm off to the snow with my daughter! In the past 2 years I was still nursing Jackson, so her Daddy got to take her to the snow, so I'm really excited to get to go myself this year. It will be a girls trip! And while she's out having her ski lessons on Friday? I'll be sitting in the nice warm lodge coloring away like a fiend!!! :-) Have a wonderful day! Good morning friends!! 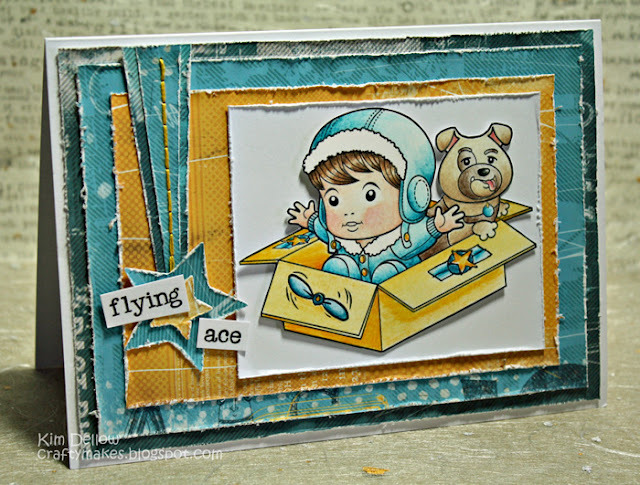 Kris here with another cute card using Sitting Marci from the Playtime Collection, released at winter CHA. She is so pretty, isn't she?? I went with sorta neutral, earthy colors for this card. Very out of my "norm" but I'm really liking how it came out! 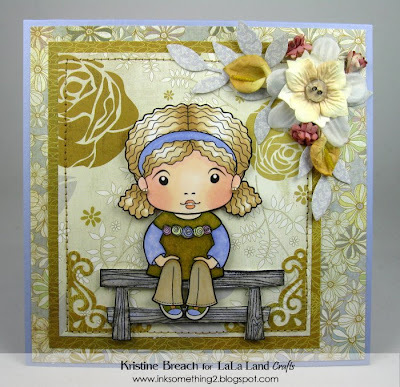 I used the Capella paper (BG), and I sat her on a bench (Magnolia). You can get her now as a digi, and very soon she’ll be available in rubber as well!! Thanks for stopping by!! Hope you get time to Ink Something! Doctor Marci in the House - Feel Better Soon! 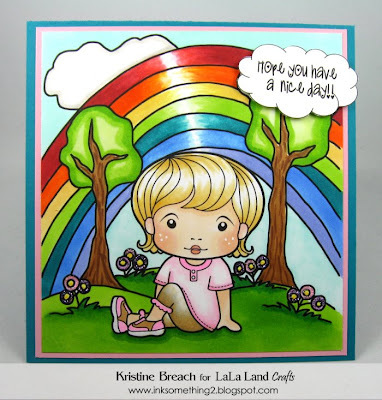 Ready for another card from La-La Land Crafts new Play Time Collection? 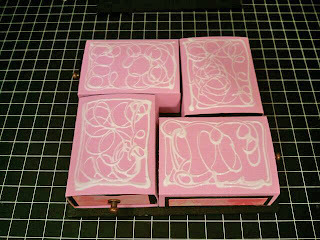 You're gonna love this new stamp! Today, I am sharing Doctor Marci who is currently available in DIGI , so you can pick her up right away! 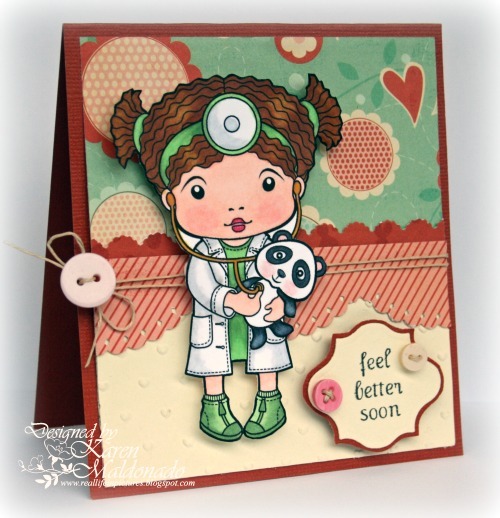 Doctor Marci is ready to send feel better wishes, and would put a smile on anyone's face with that sweet and adorable face! 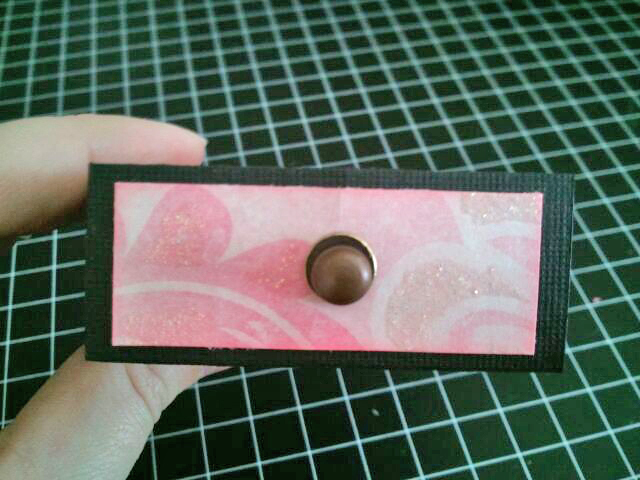 The bottom portion of my card has been embossed with tiny hearts, and I've added a few buttons here to go with the beautiful My Mind's Eye papers! 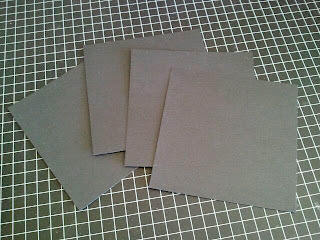 I love the non-traditional color palette of these designer papers, to match her beautiful auburn hair! Sweet reminder to let you know there's still time to upload your beautiful creations into our Customer Gallery for a chance at a prize!! 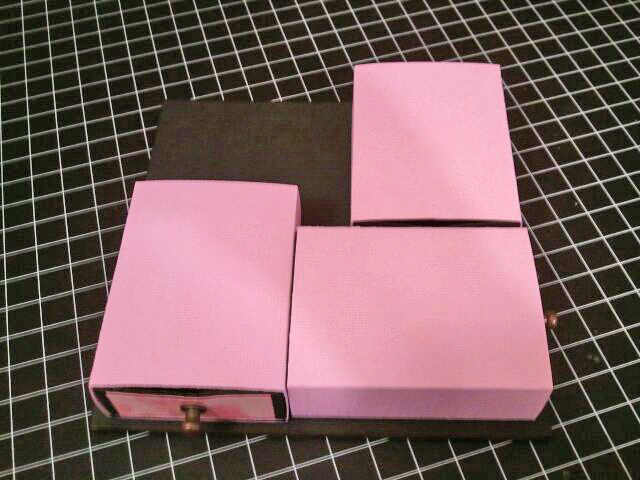 I have a little birthday magic to spread today. 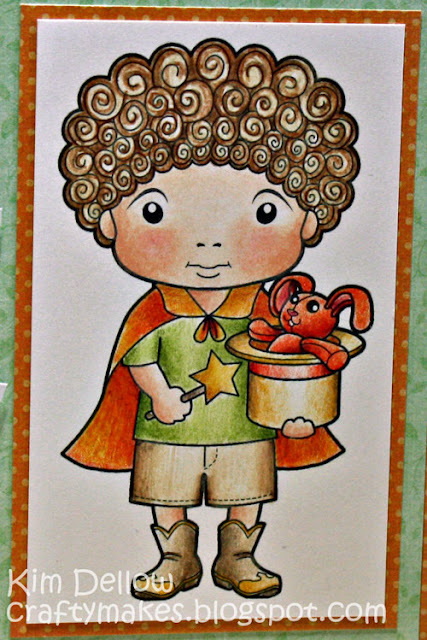 A little card using the cute Magician Luka that you can get as a digi-stamp. Good Sunday Morning!! 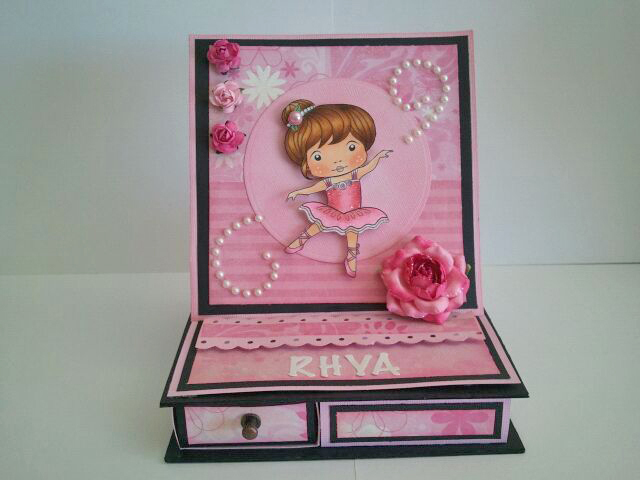 Irina is here to share a GORGEOUS card with you, made by one of our Design Team members Pam Sparks!! Another cupcake kind of day! Marci’s been in the kitchen! This is Sugar ‘n Spice Marci. So cute and fun to color! I colored Marci with the E50′s series of copic sketch markers… skin E50, 51, 53… dress, hair, shoes, cupcake E53, 55, 57, 59. No other colors or pencils or anything. I used a piece of some old 9×9 Tim Holtz pattern paper… The sentiment is a Penny Black stamp. I distressed the edges with the Tim Holtz distressing tool and then edged with Vintage Photo Distress ink (Antique Linen on the words first and then VP). 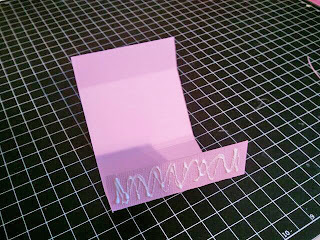 Stapled around with Tim’s tiny attacher. Some EK Success punches, the flower and border…the leaves are the SU bird/branch punch and the cord through the flower is that paper cord from JoAnn’s. 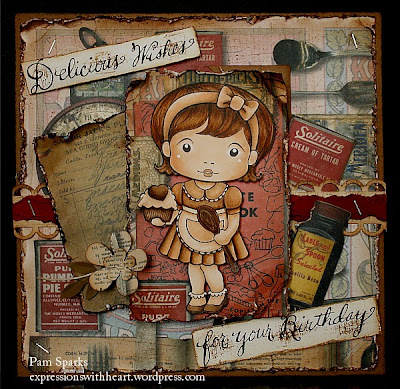 Hi everyone GDT Debbie here again. When I started to colour up this cutie I decided I hadn't honoured all the gorgeous redheads out there recently! I tend to stick to brunettes - with the occasional blonde - so it was time to try out a redheaded gal - I reckon it suits this little Marci - but maybe I should have added a few freckles - LOL. This cutie is Sweetheart Marci and you can get her in rubber HERE or as a digi HERE. This was one of those times when I coloured my image first and THEN went to look for DP in my stash to hopefully match (I do this more often than not actually). 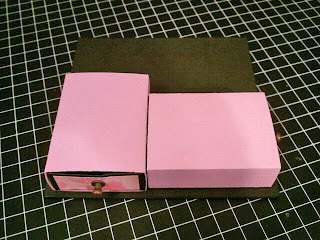 I was rapt when I discovered my neglected Kaisercraft Lush paper Pad - it was a perfect fit! Hi everyone, Welcome to my La-la Land post!!! Cindy here and I have one of the new La-La Land Crafts digi-stamps to show you. This is ~ Magician Luka ~. You can buy Marci and Luka as digis here on the blog. 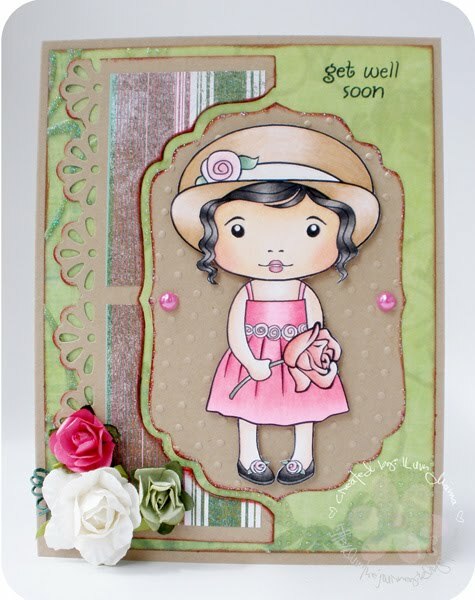 Remember if you create something with any La-La Land Crafts stamps or digis, please share with us in the customer gallery! Once a month we have a Customer Appreciation Day and one of you will win a prize! That's what I am dreaming of today! It has been gloomy all week here in LA. Well, not too bad. We did get some sun here and there. I just LOVE Capri Marci! She looks so casual here, so carefree and isn't she just the cutest?? Capri Marci is one of the nine digis from CHA 2011. For digi lovers, grab her now because she will only be available as a digi for a limited time. For rubber lovers, no worries! She is in the midst of turning rubber. LOL Stay tuned! Chef Marci in the Nooks and Crannies! Hi everyone, Jana here. Don't you just love this little cutie! I think she's just adorable. I can't wait to use her with some sweet photos I have of Julia when she was little in a cute little chef's hat and apron in her play kitchen. 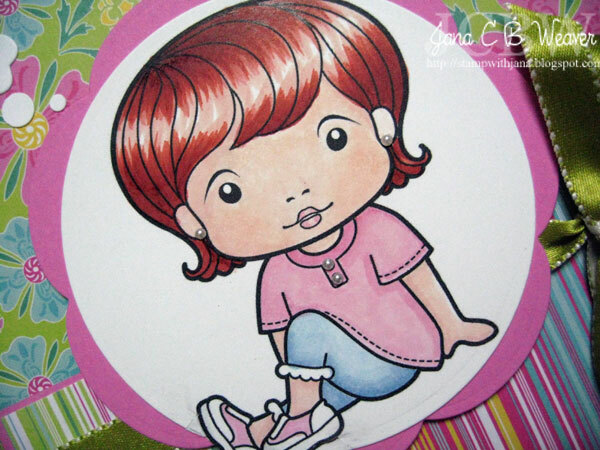 I colored her with my copics and paired her with some Basic Grey Nook and Pantry papers and my pearl brads. 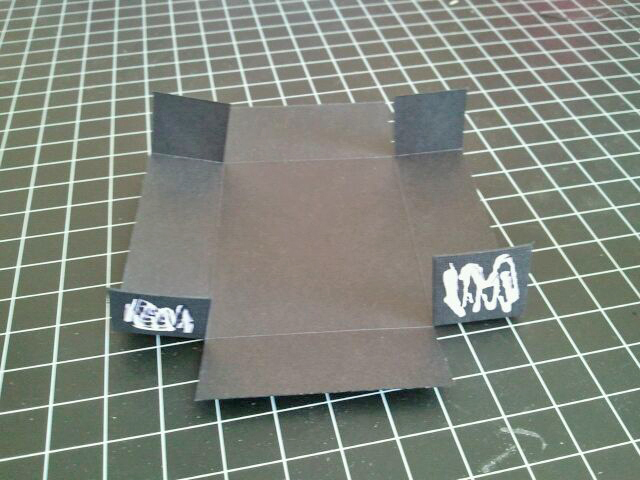 I used the Sweet Stop Sketch 95 from this week for my layout. Have you been showing your La-La Land stamps some love?? 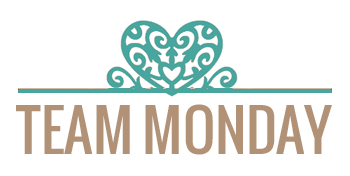 Be sure to link them up here on our blog for a chance to win Customer of the Month! Sharing Magician Luka with you today! He's one of the new digi's from La-La Land Crafts "Play Time" collection! I wanted to create a special celebration card featuring this awesome lil guy! I figured Magician Luka would be a great way to send some magical wishes to that special little one! To top off my card, I added a couple of candles that have been bundled with some blue DMC thread! The sparkly star that you see on the sentiment and wand that Luka holds are brads! 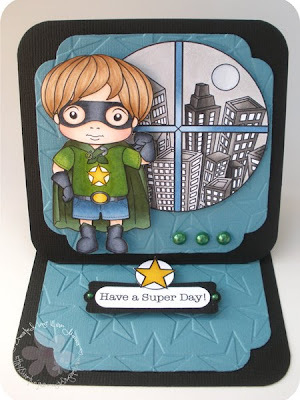 I just love the little sparkle the sparkly brads add to the card as well as carry the theme of stars highlighting the border of this card! 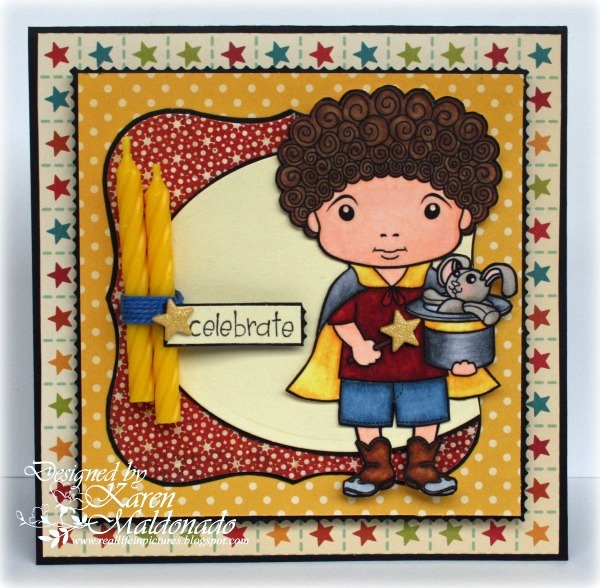 I think it will make that little one feel like a magical superstar receiving a celebration card like this! Happy Monday to you all, I have a Flying Ace to get your week started - he is the fabulous Pilot Luka that you can get as a Digi-stamp. He does look like he is having fun doesn't he? Right I'm going to fly off, you have a lovely week. 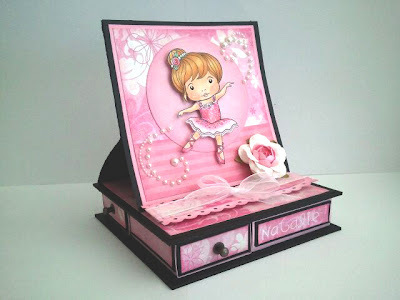 Coloring Marci Ballerina - Video Tutorials by Suzanne Dean!! We had the honor of meeting Suzanne Dean at CHA when she stopped by our booth!! Suzanne even sat down to do one of our make-and-take projects. 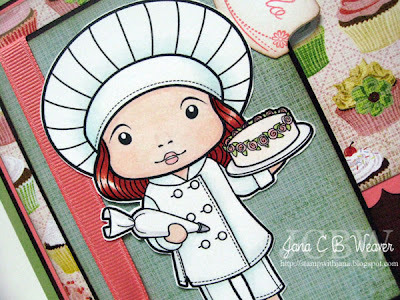 And I am now the proud owner of Suzanne's original colored Chef Marci!! 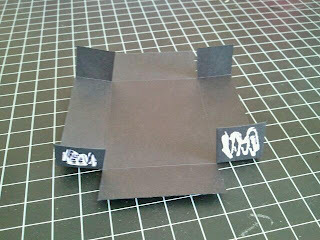 Now.. check this out!! Suzanne used OUR Ballerina Marci in her NEW series of Copic Tutorilas!!! How AWESOME!!!! 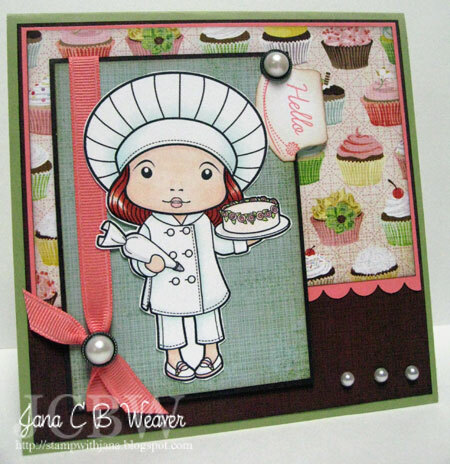 Suzanne even gave us permission to share her video tutorials on our blog.. Here they are, ENJOY!! We were told that there is a card coming up with this colored image in a few days too!!! Can't wait to see and I already know that I will love it!! Thank you SO MUCH Suzanne!!! Good Sunday morning to you!! 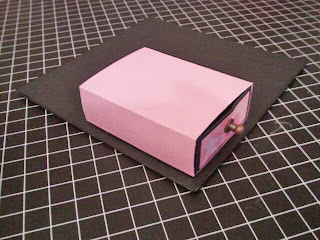 Drawer Boxes are very popular projects right now and you've seen a few on our blog here before as well. 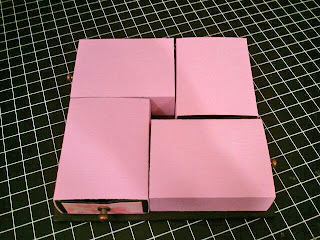 We've gotten a lot of requests for a Tutorial on how to make it and it has been on our To-Do List for a long time now!! When Irina saw one of the entries in our Customer Gallery, she just had to invite the designer to share her tutorial with all of you!! Without further ado..
Meet our Guest Designer-for-the-day... Nicole Zarra! Hi! I'm Nicole, I'm a 25 year old, stay at home mother of 2 and engaged to a wonderful man who supports me on all my paper crafting addictions lol. 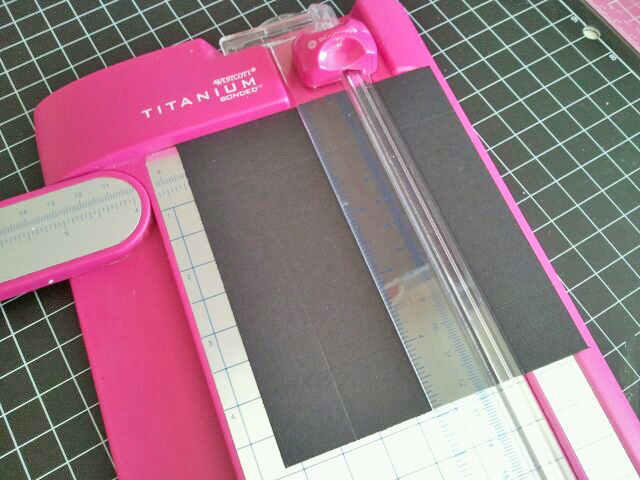 I got my first scrapbooking set when I was 14 and I was hooked ever since. 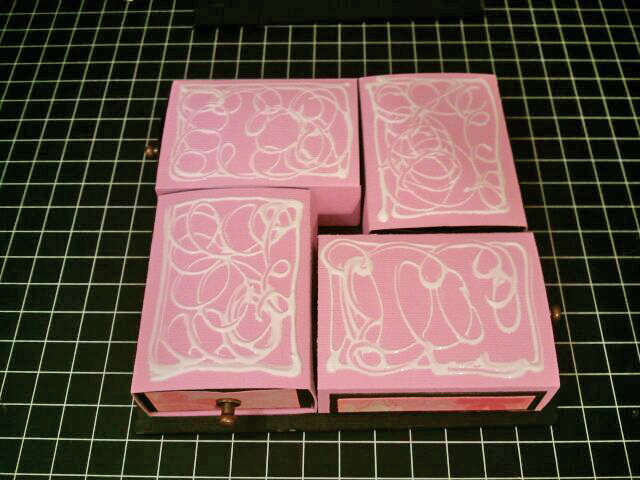 I love teaching and inspiring others to make beautiful creations. Im my spare time, when im not being a full time mommy and house wife, I teach paper crafting projects at my local scrapbooking store and spend as much time in my crafting room as possible. I hope I can inspire you to make wonderful creations of your own. 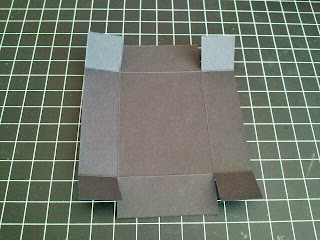 You need 2 pieces of chip board 6x6 inches. 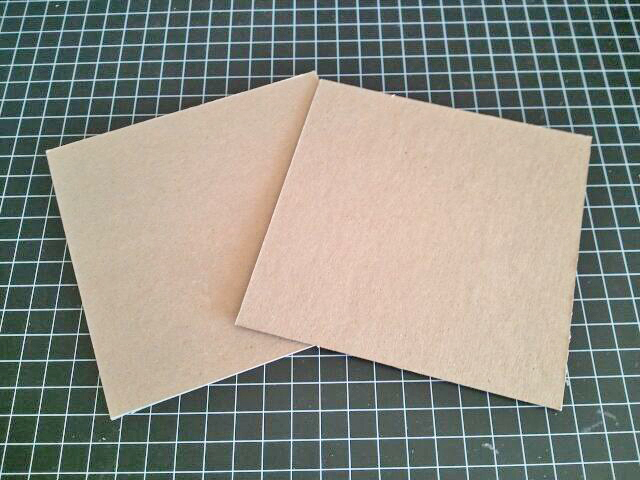 You are going to paste the cardstock on both sides of the chip boards above. 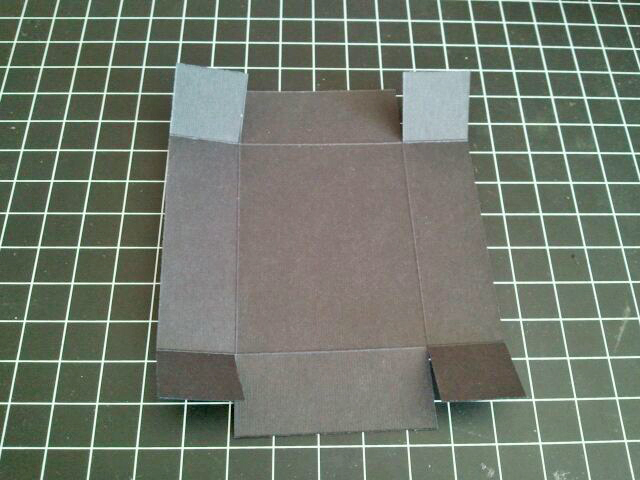 Now we're going to make the drawers. 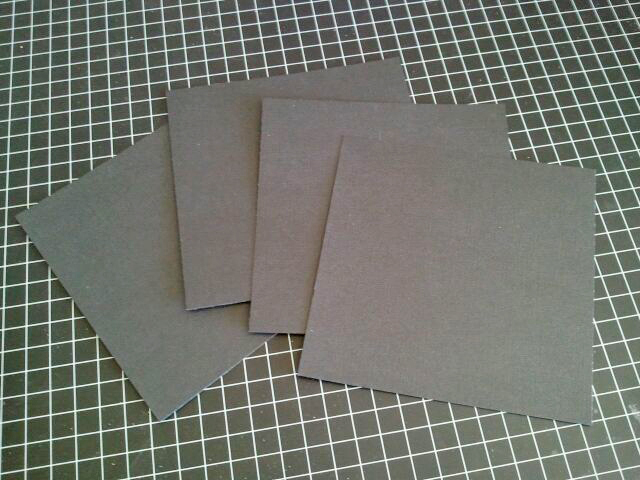 Cut cardstock at 4 15/16 (length) x 4 1/8 (width) inches, cut 4 of these. 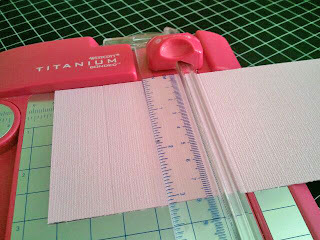 Score at 4 (length) and 3 3/16 (width). Fold the 4 corners, and your first drawer is almost done. Add a mat to the front of your drawer, 2 (length) and 3/4 (width) inches. 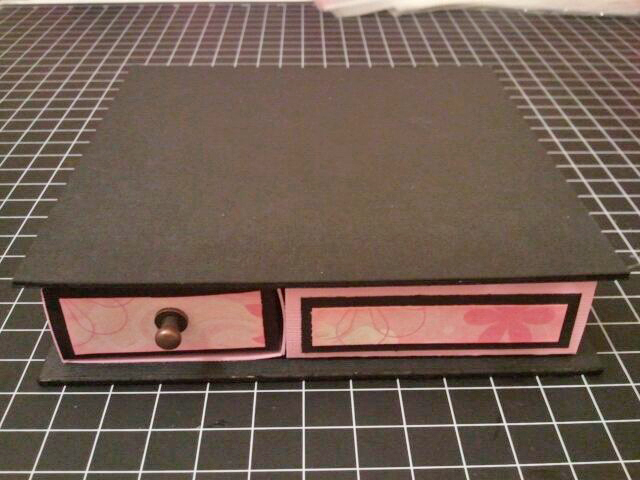 I've mounted Tim Holtz Hitch Fasteners on each drawer. Now on to the outside of the drawer. You will need 4 of these. 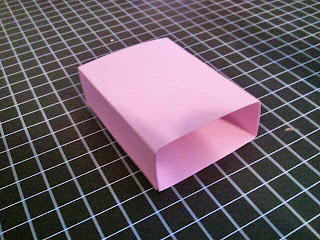 Fold and glue as shown above. We will now glue the drawers on the bottom of the box. 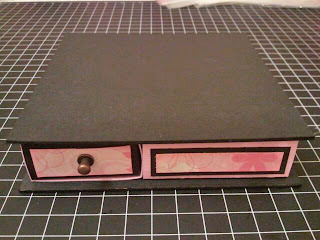 Add glue to the top of the drawers. 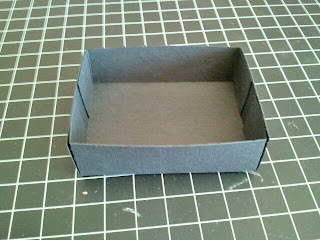 Then add the top of your box. Doctor Marci is in the House! Pilot Luka... Ready for Take Off! Baked with Luv 4 U!! Chef Marci, you make life SWEET!! We're Back from CHA...with more DIGIS for you!